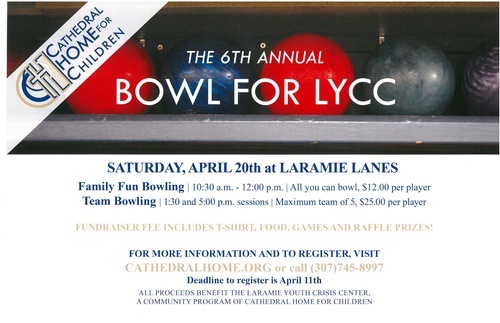 Come support Cathedral Home for Children and the Laramie Youth Crisis Center, with their annual Bowl for LYCC event! Team Bowling 1:30pm and 5:00pm sessions. Maximum team of 5 players, $25 per player. This fundraiser fee includes a T-shirt, Food, Games, and Raffle Prizes! For more information, and to register for this event, visit cathedralhome.org or call (307)-745-8997. The deadline to register is April 11th. All proceeds benefit the Laramie Youth Crisis Center, a community program of Cathedral Home for Children. Times and details for each listed in the event description.